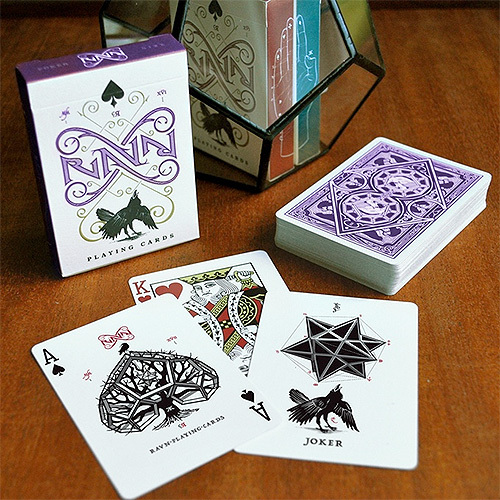 Ravn playing cards are back, in purple! A custom-designed deck of poker size playing cards designed for Caroline Ravn magician. Perfect to perform magic tricks, cardistry, and of course to play at the green table. The deck has been printed by Cartamundi on a special paper stock with specific varnish designed for better handling and durability. 56 Cards printed on Cambric 310gr Black Core paper with 9C² varnish. Ok, but what is this? In 2016 Cartamundi manufactured a special deck that was presented at the Cardistry-Con, in Berlin. They focused on the paper and the varnish, not just the graphics. Cartamundi is stepping in with this amazing paper stock and finish that is smooth and durable, specifically designed for cardists. This deck features 56 cards: 52 standard faces with improved courts (JQK) and custom Ace of Spades. 2 custom jokers. gaff card: duplicate card (7 of diamonds). gaff card: double backer. The look of the 12 court cards have been improved. The faces of the Jacks, Queens and Kings look better, and their hands have been redrawn as well. The 2 Jokers are similar to the first version of Ravn, but with a twist. The back-side design is the same as the previous version, different color. The first Ravn's tuck-box has been printed on Natural Pearl paper by USPCC. Cartamundi provides Star-Dream Opal 285gr paper, and of course it will have the embossed graphics. The design of the tuck-box is the same, so it matches the first version. • The cards are poker size.